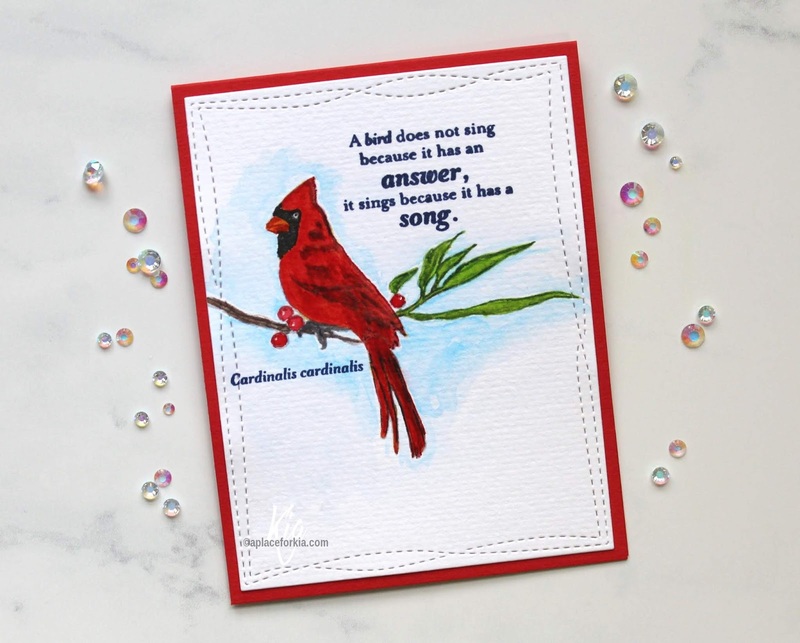 Two Cardinal cards to share, this one by Gina K. Designs and a whimsical one that I drew in art class this past week. 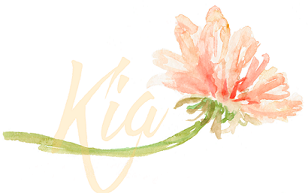 The beautiful image by Gina K. is from the set called Snow Birds, and I love it. I will share with you the birds from the set over the next week or so. But first, this card. I painted with Daniel Smith and Schmincke watercolours, using orange/reds colours and a deep red, sepia and burnt umber, sap green and manganese blue, and painted in layers. The beak has a yellow underlay, with the orange/red over it. The picture below shows a close up of the cardinal where you can see the oranges in the bird. I used Tonic Studio watercolour paper and stamped the sentiment using Ranger Archival Cobalt Blue. My whimsical bird comes from art class this past week. My teacher know I dislike drawing, so every now and then she makes me draw. I dare say, it takes me forever to get it, and this card I finally made after much practise, and I still mucked up the left bird shape. But, they are cute and they are made using upside down tear drops with hearts for the face. The birch trees are easy enough, it was the shape of the birds. The background is done with cerulean and sap green. The other watercolours used are burnt umber, burnt sienna, raw sienna, sepia, payne's grey, cadmium yellow light, cadmium red light and cadmium red deep. 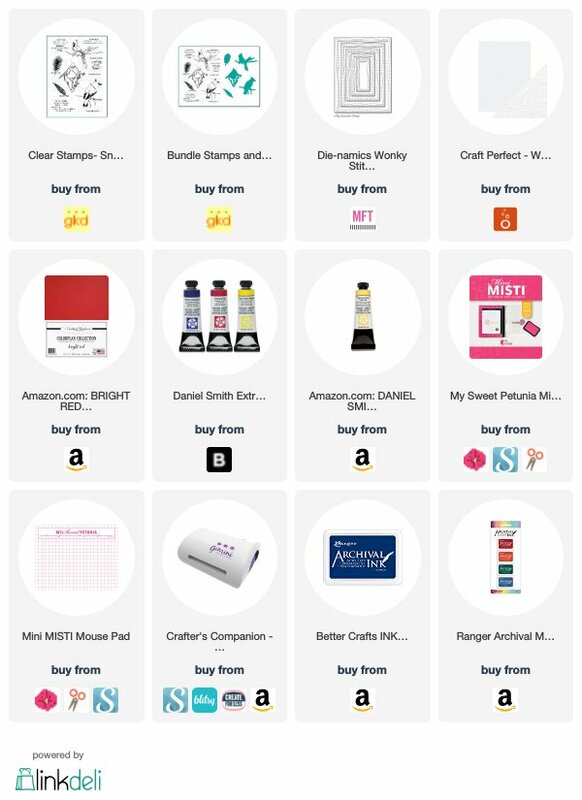 I hope you have enjoyed today's cards, and wish to thank you for visiting today. Your cardinal of the first card is stunning! Your coloring is fantastic (especially the shades of red). 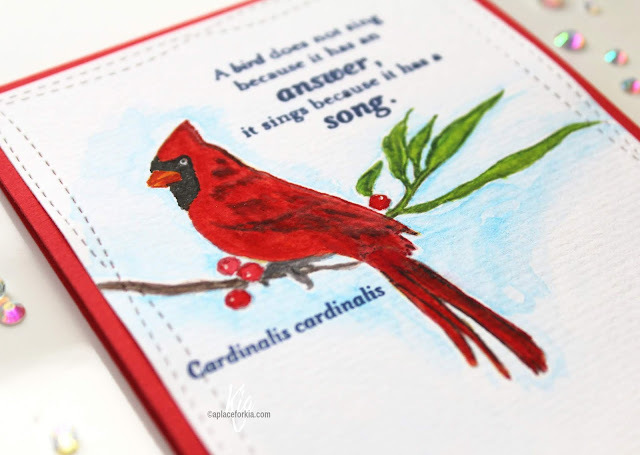 And I LOVE the whimsical cardinals you drew as much! 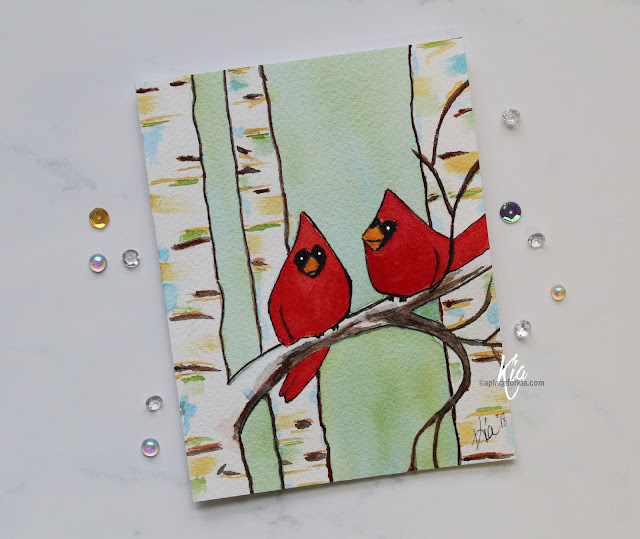 They're so cute and the colors on the birch trees add so much fun to the card.